Singers for Hire is home and the only place to book Marco; the original Singing Chef. Marco’s first “Undercover Chef” performance was in the Maritim Hotel, Gelsenkirchen, Germany on New Year’s Eve in 2003. Singers For Hire was established in Ireland on the strength of his popularity when he moved home to Limerick in 2006 (after singing at the World Cup celebrations in Schalke). Since then, Marco, who has been singing professionally for 25 years, on the musical theatre & opera stage and his singing waiter colleagues have entertained at weddings and events for clients in Ireland, London, New York, Dubai, Abu Dhabi, Sydney (where our sister company was established in 2012), as well as Canada and China. “Just a note to thank Marco so much for his wonderful performance at our wedding. Everyone absolutely loved it and are all still raving about it. With such a small wedding everyone got involved and it really added to the party atmosphere and celebrations. My 5 year old niece even said it was her most favourite thing about the whole wedding…..now that’s a compliment! A wedding anniversary is an amazing achievement and a wonderful family event. The perfect wedding anniversary entertainment can make it even better. As children or friends of the couple you’ll want to do something special, something memorable and interesting. Boost morale, foster teamwork and build group spirit with a Coffee Break Concert by Singers for Hire the Singing Waiters Company. Bring a burst of energy to banish the workday morning blues. Singers for Hire unique coffee concert presentations promote positive mental health and engage happier more engaged co-workers. Singers for Hire’s Disney singing waiters show will transform your special day into a magical Disney wedding spectacular! Hits and melodies from Disney’s “Jungle Book”, “Mary Poppins”, “Beauty and the Beast”, “Lady and the Tramp” and many other hit musical shows. Whether you are looking for a stunning soprano, a tremendous tenor, a brilliant baritone or an alternative alto; Singers for Hire has the opera singer for you. From musical duos and three tenor groups to amazing opera quartets your guests will be entertained with thrilling arias, romantic duets and hair raising ensembles from the world’s most famous operatic masterpieces sung by the very best opera singers for hire. Surprise your best friend or partner with an unexpected serenade by one of our top class opera singers for their next birthday? We have surprise singing entertainment that has delighted birthday boys and girls to great acclaim in locations as varied as four star hotels, rural pubs, offices and even on their own doorsteps. Singers for Hire surprise singers have delighted office party groups and clients for years. A surprise Christmas serenade from our singing chef or singing waiters can be just the thing to liven up your work’s big night out. We have been meaning to get in touch for a while to say a HUGE thank you. We got married in Westport last October and Marco entertained the whole wedding. 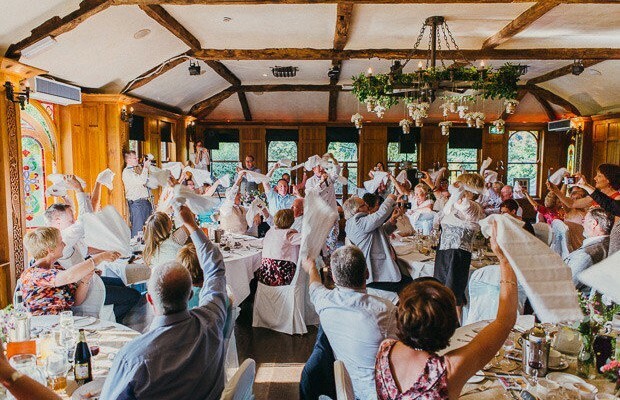 One of our favouroite parts of the day was watching all of our guests on their feet dancing and singing along to Marco, napkins flying in the air. I turned to my husband and said I have never seen anything like this at wedding before, we were blown away just as much as our guests were. Thanks so much again for adding so much fun to our day. Just a short message to convey our utmost happiness and sheer delight with Marco the singing waiter. He was absolutely fantastic. The Christmas Carols, the 12 Days of Christmas (performed by guests, directed by Marco) and the whole performance was just top class. We love fun and loved the fact that Marco brought the element of fun and liveliness into a 5 star location. It was everything and much more than we had anticipated. We would have no hesitation in recommending your services. Just wanted to say thanks for sending us Marco the Singing Waiter! Our guests are still raving about him, he was fantastic, complety made the dinner, still laughing. Just wanted to drop a quick email to say thank you to ‘Marco’ and your Singing Waiters team. It was a major highlight of our day & just blew of all our guests away. We are still getting compliments & people singing his praises. Thank you for the communication & planning beforehand. I’ll be recommending you to everyone. 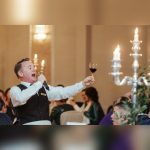 I just wanted to send a little message to say a massive thank you for your Singing waiters performance at our wedding in Rathsallagh - you totally stole the show and everyone is still talking about it! I even heard you had to put up with one guest demanding more wine... So thank you for humouring him.... He was mortified when he realised! What can I say? That was an absolutely terrific performance. They really put on one hell of a show. The crowd really enjoyed it. I would highly recommend your singing waiters, they were worth every penny. I would just like to say a massive thank you for last Saturday, you were absolutely amazing! All the guests are still talking about it! Fantastic show and what an amazing voice! The groom got the best surprise ever! So many many thanks for the singing waiters entertainment, we will remember it forever! Friends and family are still going on about the singing chef. I have given your details to friends who will be getting married. It was absolutely fantastic. We throughly enjoyed it. We were delighted with the singing waiters show. OMG the singing waiter was out of this world. He certainly was the highlight of our day. We had a Disney theme wedding and he sang a couple of songs from beauty and the beast. The guests were on their feet throughout his performance. If I ever have another party I be sure to get you back.